Jim Carducci is an engineer with a passion for dual sport motorcycles and the Harley Sportster motor. 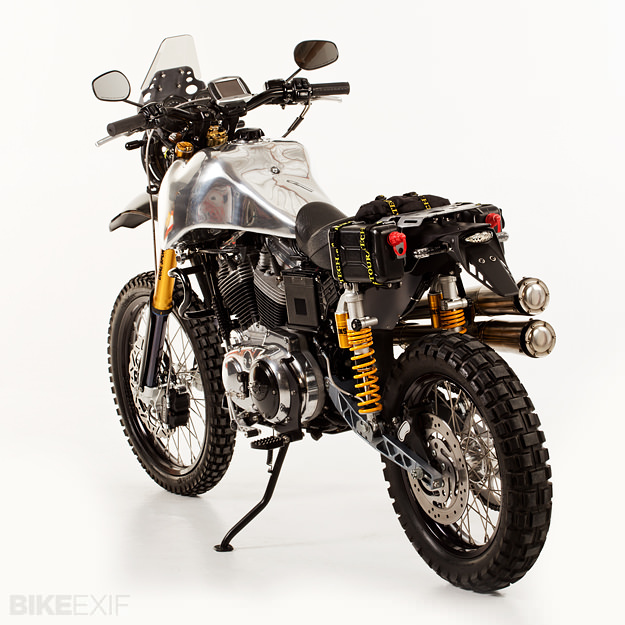 So he’s put the two together and created the Carducci Dual Sport SC3 Adventure. 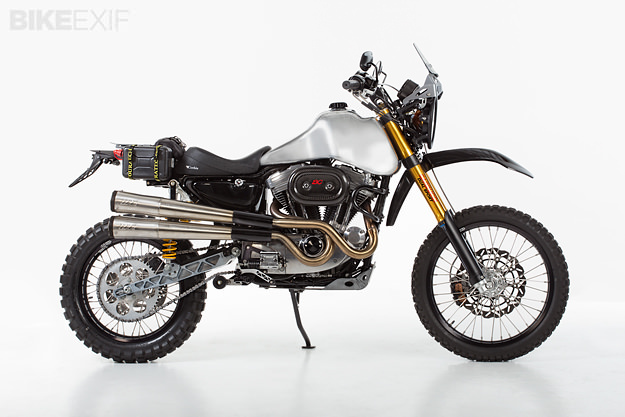 Jim bought a 2003 100th Anniversary Sportster “donor” bike—one of the last ‘hard mount’ Sportsters, with a lighter motor than the newer 2004+ model rubber-mounted motors. He then created 2D AutoCAD layouts to lock down the geometry of the frame, motor, suspension, wheels and rider position. The goal was to get the optimum rake and trail, plus 8+ inches of rear wheel travel and 10+ inches of front wheel travel. The instantaneous force center is now well below the combined CG of the bike + rider—needed for the rear suspension and the traction to work well under acceleration. With the basics sorted, Jim began a 3D solid-model detailed design. He built a full-scale 3D Styrofoam model of the aluminum 6-gallon gas tank (which was hand formed by Evan Wilcox). He also created a billet aluminum swing arm, triple clamps designed to integrate a Scotts steering damper, and vibration-isolation bar risers. 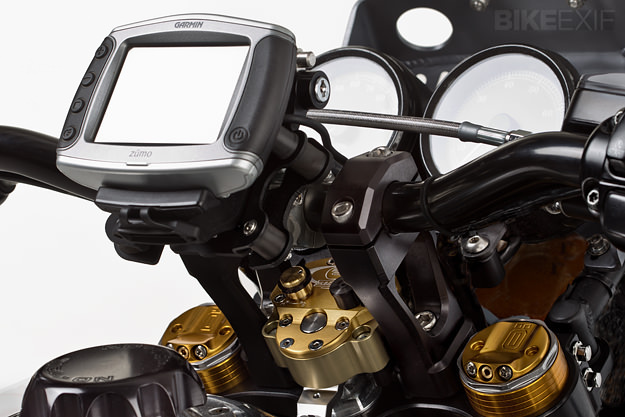 Next came a GPS mount, foot controls, a rear fender sub-frame and rack, a crash bar, a fly screen and a skid plate. And last but not least, a kickstand. Corbin made a seat to Jim’s specs. The Sportster motor was upgraded with an NRHS 1250cc kit and Andrews N4 cams. 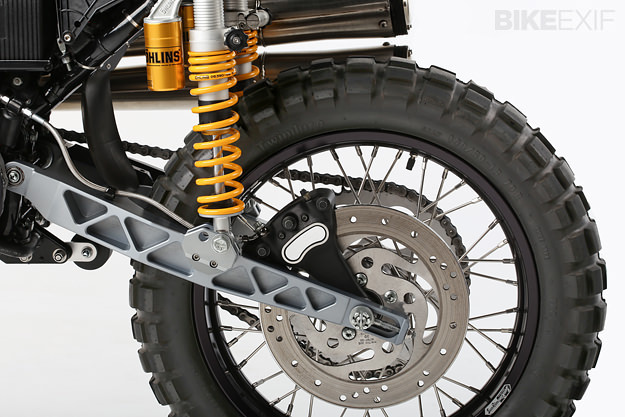 The rest of the components are high-spec too: Öhlins forks and rear shocks, configured to handle the Harley’s weight, plus 18” and 21” wheels from Buchanan’s, with Sun rims and a Talon front hub. The exhaust system is from Supertrapp, Biltwell supplied the 1” diameter handlebars, and the foot pegs are from Joker Machine. Two and a half years later, the bike is more than ready to ride, but Jim isn’t quite finished yet. “I’m currently designing a new exhaust, to make standing up for long periods easier on the rider. 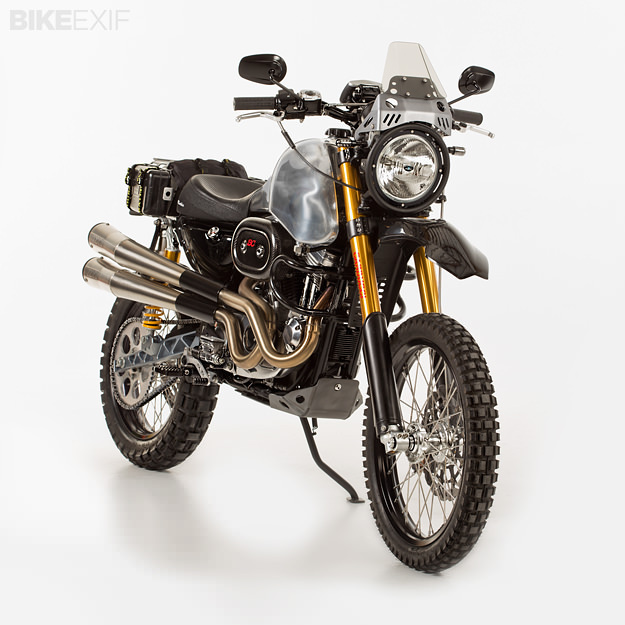 I’m also formulating an idea for panniers.” San Jose Harley-Davidson has approached Jim to build bikes for customers, and he’s teaming up with the dealership to get more SC3 Adventures out onto trails and roads around the world. Top marks to Jim Carducci for going where few others have dared. 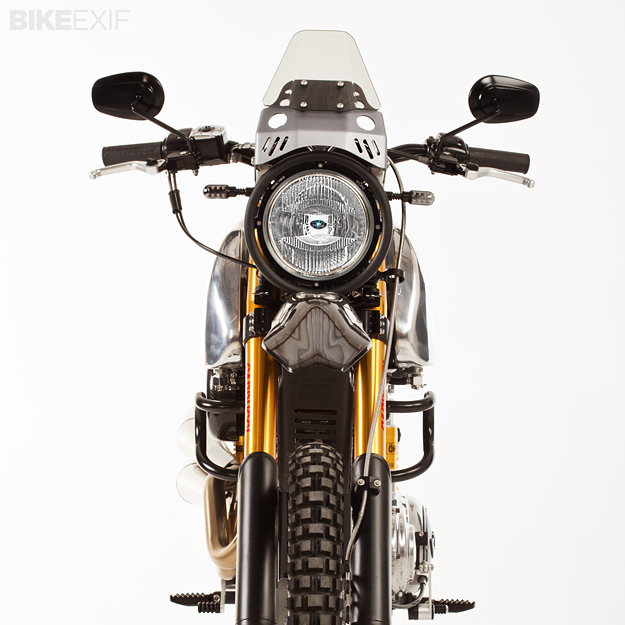 The Carducci Dual Sport motorcycle might not be an ‘official’ bike, but there’s nothing amateur about this build. For more on the SC3 Adventure, head over to the Carducci Dual Sport website. Images by Neil Hanshaw.